Invisalign® is a state-of-the-art alternative to traditional orthodontic care. Using clear plastic aligners rather than brackets and wires, a patient can have their teeth gradually realigned. The system consists of a series of aligner trays, each one designed to gradually shift the teeth into an optimal position. The team at our Orland Park dental practice have helped numerous teens and adults achieve beautiful, healthy smiles with Invisalign®. Let's take a moment to consider a general treatment timeline for Invisalign® patients. When the Invisalign® aligners are in place, they are very difficult to see, which means patients can smile and laugh without feeling self-conscious. What's more, Invisalign® aligners are removable. You can eat what you like, brush and floss normally, and clean the trays themselves with ease. The first step of the Invisalign® treatment is the consultation process. During this initial consultation, a dentist can determine if Invisalign® is the right option for you and your needs. Sometimes a patient may be better served by undergoing a more involved orthodontic procedure given the nature of their malocclusion. If you are a good candidate for Invisalign®, the next step will be to devise a custom treatment plan. Using a digital scan of your mouth, a dentist can input the information into a computer, which will develop a series of aligners for patients to wear. Invisalign® is as simple as that. Every two weeks, a new aligner tray will come to help with the realignment of the teeth. During the treatment process, patients will visit their dentist so their treatment progress can be monitored. Patients are encouraged to contact the practice if they have any additional concerns between visits. Getting answers to pressing needs is a great way to ensure proper patient care. How Long Will Invisalign® Treatment Take Overall? Overall, Invisalign® treatment can take between nine months to two years. The overall time required will vary from patient to patient, and it will depend on the degree and nature of the patient's malocclusion. During the consultation, a general estimate for the duration of the treatment can be provided. Is Invisalign® Faster Than Traditional Braces? Not necessarily. 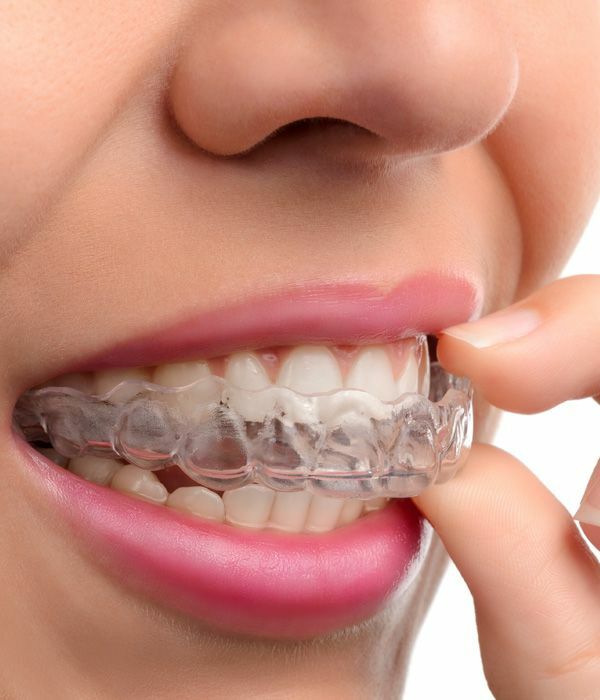 In most cases, a patient will wear Invisalign® trays for about as long as they will wear traditional braces. Sometimes treatment isn't over after the final Invisalign® tray is worn. Dentists may make final cosmetic or restorative adjustments to the teeth to improve the appearance of a smile. For more information about Invisalign® and how it can help you have a healthy and beautiful smile, be sure to contact our advanced dental care center today. Our dental care team is here to help you smile with renewed confidence.